September | 2015 | LIT.GAZ. 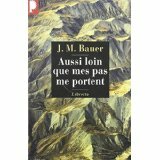 Aussi Loin Que Mes Pas Me Portent is by J M Bauer, and was originally published in German in the 1950s; and English translation apparently exists, called As Far as My Feet Will Carry Me, and it has also been filmed. 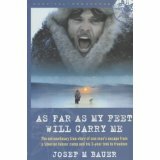 It purports to tell the story of Clemens Forell, a Wehrmacht officer imprisoned in the Soviet Union after the Second World War, his escape from a forced labour camp – a lead mine – at the very edge of the country, opposite the shores of Alaska, and three-year journey to freedom by eventually crossing the Iranian frontier. It’s an astonishing adventure, if it is true. But there are quite a few things that call aspects of the account into question. It reminds me very strongly of The Long Walk by Slawomir Rawicz, which tells the story, allegedly, of the escape of a group of Polish prisoners from Soviet captivity during the same war, who eventually make it to British India. This book was famous among my father’s generation, because this story was the story of their generation, their country and their struggle with he Russians. (It was also filmed, a few years ago.) And it has transpired over the years that the account was not exactly what it purported to be, Rawicz having put together the story as a composite of the accounts of several people he met, rather than his own adventures. Similarly, when I started to look up the author and the hero of the first book, it turns out to have been put together by a novelist, that the hero’s name is a pseudonym, and that he was back in Germany two years before the events described in the book began. So is this another docudrama, another fictionalisation of reality, or what? I found it a tad incredible that the Russians would march prisoners from Chita, by the Mongolian border, all the way to Cape Dezhnev, opposite Alaska (look at the map!). 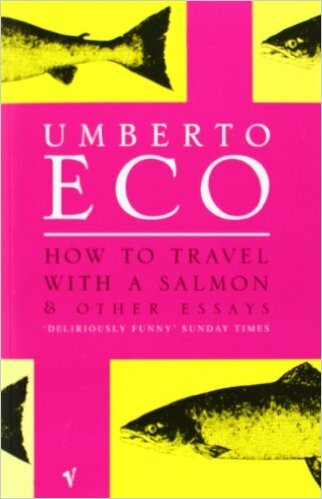 There’s nothing that incredible about the journey itself, perhaps, and the hero’s adventures, except that his journey is extremely haphazard, and devoid of almost all detail in terms of place names – the map in the French edition is dreadful and needs a telescope to view it – but after about 450 pages, and a third of the way, the remainder is very telescoped, rushed through, almost. This is not the sign of a good novel, and perhaps enhances the veracity of some of the account. But the hero travels several thousand kilometres through the Soviet Union of the late 1940s without papers or real scrapes or encounters with authority, which I do find barely credible… and this version, the French translation, appears to be twice the length of the English version now long out of print. I also found the attitudes of Russians and Germans to each other rather stretching of my credulity. Nowhere do any of the Germans acknowledge any war guilt or wrong-doing (perhaps this wasn’t fashionable in the 1950s), but they don’t complain of being hard done by, either. Quite a lot of Russians seem helpful to Forell; this I find hard to take, given that we are only a couple of years after the end of the war, and every Russian would have known of the vileness of German behaviour in the Soviet Union. I really enjoyed studying French literature at university, and the year in France that was part of the course enabled me to begin to understand the country, its culture and literature, as well as firming up my knowledge of and fluency with the language. Because I was studying two literatures (three, if I count American separately) I began to see links between the histories, cultures and literatures of nations, and this has stood me in good stead all through my reading life, as I’ve branched out further. I like to have a good travel guide when I’m off exploring somewhere, whether new or familiar: there’s always something I want to find out more about, and though it’s possible to access information online instantly, a lot of it is very superficial; you can settle down with a good guidebook, flipping back and forwards through the pages, with a finger in at the page with the relevant map on… and so on. You can tell I don’t do it all through my phone. So I was pleased, as I revisit some of the key sites of the Great War in Northern France, that Michelin have published a new series of guides to various battlefields. They were quick off the mark in the 1920s with a series in both French and English which has apparently been reprinted (by G H Smith of Easingwold if you are interested); the new series is obviously to link in to the centennial of the war, but seems only to be available in French, and is illustrated with pages from the volumes of a hundred years ago. Nevertheless, the book is good because detailed and carefully produced, which is the case I’ve always found with Michelin guidebooks: they are objective and informative without being patronising or trendy… and, looking forward (hopefully) to a visit to Verdun next year, I have also purchased that guide to prepare myself.